The amended version of HB 4244 has been circulated in public. The following are some observations and questions on the latest version. 1. Amendments. 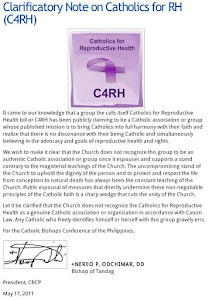 It would be a misnomer to call the acceptance by the anti-RH camp and the CBCP of the amendments offered by the sponsors as “compromises”. The word “compromise” presumes that opposite sides while having different starting positions share in a desired outcome (peace in Mindanao for example in the case of the Bangsa Moro framework). 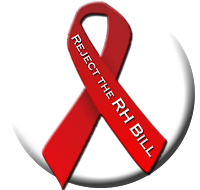 Given the intrinsically evil nature of contraceptives and contraceptive acts and the adverse consequences on families and society of a contraceptive culture, the anti-RH position can hardly agree with the inevitable outcome of the RH bill for Philippine society. The Aquino administration however seems determined to deliver an RH bill which happens to coincide with the position of Obama, Hillary Clinton, and the MCC, and as manifested by the heavy-handed way in which the period of debates in the Lower House was drastically ended last August. 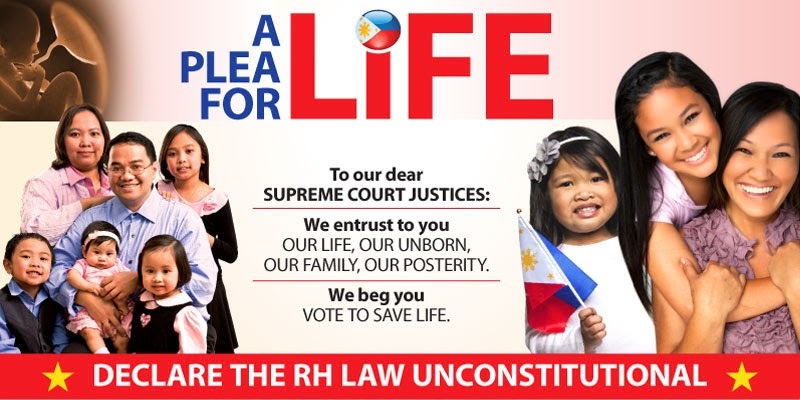 If the pro-RH camp goes ahead and rams the bill through Congress, the proposed amendments may have to be accepted tactically as damage control to reduce some of the “nasty” aspects in the bill, such as the coercive provisions and the distribution of abortifacents. While this revision finally owns up to the ulterior motive of HB 4244 to discourage the poor from breeding, they immediately raise a lot of welfare economics questions. a) Is this really the first best, or even second- or third- best way to help the poor? Why prioritize free condoms, IUDs, and pills? Why not free anti-TB, anti-malaria, anti-diarrhea medicines; cheap bottled water; oral rehydration powder, etc. which would be more directed at the leading causes of illness and death among the poor? b) How will the poor be identified? The revised bill proposes: “… THROUGH THE NATIONAL HOUSEHOLD TARGETING SYSTEM FOR POVERTY REDUCTION (NHTS-PR) AND OTHER GOVERNMENT MEASURES OF IDENTIFYING MARGINALIZATION…” Is this part of the Conditional Cash Transfer apparatus? Will acceptance of contraceptives now be one of the conditions? This NHTS-PR appears about 8 times in the revised bill and will be relied upon for eligibility for pro-bono services, anti-poverty programs, procurement and distribution to LGUs, etc. a. How will they be documented? Will they be given IDs or plastic swipe cards which they can bring to drug stores to get free condoms and pills? (Unless the NHTS-PR is geared up to certify their poverty each time before they want to do the marital act). b. Will there be one ID per couple? Will they have to show a marriage certificate? Who will keep the ID, the wife or the husband? Shouldn’t the wife be given control of the ID? Will a separate ID be issued to the husband who might then use it for extra- marital pursuits? c. Will an ID be issued to the other members of the poor marginalized family who have reached reproductive age? d. What will be the cut-off income? How will the government prevent poor couples from selling in a black market their free pills and condoms to non-poor couples who do not qualify? f. The bill provides that the “(FDA) SHALL DETERMINE THE SAFETY, EFFICACY, AND CLASSIFICATION OF PRODUCTS AND SUPPLIES FOR MODERN FAMILY PLANNING METHODS PRIOR TO THEIR DISTRIBUTION, PROCUREMENT, SALE AND USE.” Many contraceptive pills are classified as first class carcinogenics. Since the bill requires the FDA to ensure the safety of contraceptives, when the incidence of cancer increases from the free pills distributed to the poor, will the government accept the liability and provide free cancer treatment? Or will there be a legal disclaimer at the back of each ID stating that the recipient takes the pill at her own risk and discharges the government of any liability for any harm that the pills could cause? c) What is the estimated cost of providing free reproductive services and supplies to the poor? Using round numbers 25% of Filipinos are below the poverty line according to NSCB, or 5 million of 20 million families. Assuming 80% acceptance of free contraceptives, and P500/month cost of contraceptive supplies per family, this translates to P24 billion a year. If you use the SWS self-rated 10 million poor families, the number goes up to P48 billion. Of course the P500 can be higher or lower depending on the contraceptives supplied. a. Following the principle of fiscal responsibility will there be revenue measures identified to fund this new expenditure program? Will the funding come from taxes collected from the general public, including Roman Catholics? b. Or will the funds come from of grants or loans form the Bill and Melinda Gates Foundation, USAID, Millenium Challenge Corporation, etc.? a) There is no definition of “TRULY HUMANE WAY”. Who will determine and define this, the State? Will the State set quantitative criteria such as minimum nutritional requirements, square meters of living space per child, ownership of appliances, etc? Will the State use present earning capacity or the expected permanent income of both parents? How will it allow for the possible increase in income of the breadwinner in the future? b) Based on this clause, will the State then withdraw any support for openness to life if parents bring children whom they cannot raise in a “truly humane way”? a) How can the State dictate the mental reservations of the health care provider? Conscientious objector na nga, eh. b) Why is the state requiring the healthcare provider to violate his/her own internal disagreement by requiring him to refer the case to another health care provider? c) To whom or how will the health care professional report or register her “WITHOUT IN ANYWAY AGREEING OR ENDORSING” the contraceptive or IUD or the sterilization? To her Mother Superior? To her Confessor? At her Particular Judgement after death? 5. Other issues, new or carried over from the previous version. Many of the provisions duplicatethe Magna Carta for Women which is already a law. The issue of penalties for doctors who refuse to treat failed abortions is already be covered by professional medical malpractice regulations and do not require a separate provision in an RH bill. In sum, while the revised bill has taken out some coercive provisions and tries to de-emphasizeabortifacents, it is a hodgepodge of awkward attempts to make it seemingly acceptable and reasonable. It puts State power behind widespread distribution of morally and medically harmful contraceptives. Unfortunately it now uses questionable welfare economics in the name of supposedly helping the poor. 1. What does the Bill say about effectiveness? Does it provide equality to protection of life BOTH for the mother and the unborn child from conception? 2. Once a drug enlisted to be one of the very general term “Modern Family Planning Methods” has established doubtful effectiveness, does the Bill provides mechanism to remove it from free circulation? 3. If the Bill does not promote abortion, then any “abortifacient” or effect to increase likelihood of abortion (chemical or mechanical) within the list of “Modern Family Planning Products” must also be removed. Is there a mechanism for this provided for by the Bill? 4. It is true that in the amended version of the Bill, the “Food and Drug Administration (FDA) is charged with the determination of the safety, efficacy and classification” of the Modern Family Planning products, however the same Bill must place criteria for “safety” and “efficacy”. Moreover, products that are neither “drug” nor “food” such as condoms must also be taken cared of, unless this product is under FDA authority. 5. Once becoming a law, will it automatically revise or amend, the Revised Penal Code? Part of every new law is to amend or change pre-existing laws contrary to it, except the Constitution. If “yes”, then the assumption that abortion is “already” illegal seems to become invalid eventually.